For the first time in history, a crowdsourced team of amateur citizen scientists has discovered a multi-planetary system. 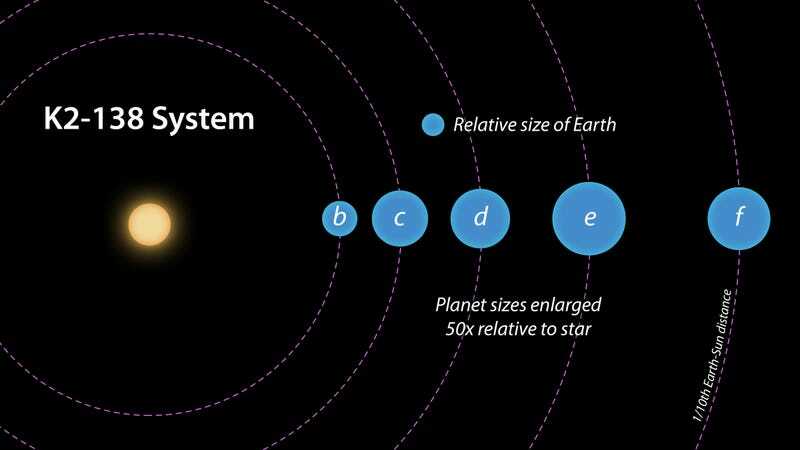 Located 620 light years away, the system contains five exoplanets, and possibly a sixth, the majority of which are super-Earths. Before we get into the nitty-gritty of how it was discovered, let’s dive in and take a look at the new star system. It’s called K2-138, where “K2" signifies that it was discovered by the Kepler Space Telescope during its K2 mission—an exoplanet-hunting mission that’s been ongoing for the past three years. The star itself is a main sequence K-star, or orange dwarf, a type of star that feature masses between 0.45 and 0.8 times that of the Sun. All of its five confirmed planets are packed into a tight orbit in close proximity to the star, featuring orbital periods between 2.35 days to 12.76 days. The most distant planet, K2-138f, is one-tenth the distance that Earth is to the Sun. The planets, all rocky, range in size from 1.6 to 3.3 times the radius of Earth, qualifying them as super-Earths. Due to their close proximity to the star, these planets are almost certainly uninhabitable. These planets are also in a really neat orbital configuration called a “resonance” in which each planet takes 50 per cent longer to complete a full orbit than the next planet further in. K2-138 is no TRAPPIST-1—a star system containing seven Earth-sized planets, including three located within the habitable zone—but it’s a cool discovery nonetheless. It shows us yet another way that star systems can be configured. But the story of how K2-138 was discovered is also pretty neat. The multi-planet system was detected as part of the Exoplanet Explorers project, which uses the online Zooniverse platform and data from NASA’s Kepler Space Telescope. Kepler works by measuring the brightness of stars. Astronomers, whether they be professionals or amateurs, look at these measurements in hopes of finding dips in a star’s luminosity. A dip typically indicates that a large object—namely an exoplanet—has passed in front of it. In the past three years, Kepler has logged data from 287,309 stars— a number that climbs another 10,000 every few months. Known as the C12 dataset, this represents a hideous amount of data for scientists to sift through. And that’s where Exoplanet Explorers—and the assistance of citizen scientists—comes in. Exoplanet Explorers, founded by Caltech staff scientist Jessie Christiansen, was launched in 2017, and it has attracted thousands of citizen scientists to the cause. Recently, the Australia Broadcast Corporation featured a three-part programme called Stargazing Live. Audience members were encouraged to participate by parsing through the data in search of candidate exoplanets. During the Stargazing Live series, results from more than 10,000 viewers were collected by the Exoplanet Explorers. Christiansen, along with UC Santa Cruz astronomer Ian Crossfield and NASA astronomer Geert Barentsen, examined the incoming data, resulting in many new candidates, including 44 Jupiter-sized planets, 72 Neptune-sized, 44 Earth-sized, and 53 so-called super-Earths, which are larger than Earth but smaller than Neptune. And that’s exactly what they did—detecting a star with four planets orbiting around it. Three of the four planets received “yes” votes from 100 per cent of participants, while the remaining planet got “yes” votes from 92 per cent. Following this stage, the scientists continued to study the system, finding a fifth planet, and hints of a sixth planet as well. It’s now the first multi-planet system discovered entirely through crowdsourcing. Yay, citizen scientists! More of this, please. We need to find even more planets—and hopefully next time the planets will be a bit more... hospitable. The ensuing paper has been accepted for publication at The Astronomical Journal, but a pre-print can be found at arXiv.